On the southernmost tip of the Andes - the extreme south of Patagonian Chile - are three looming great stone towers, standing like solemn granite guardsmen over a ruggedly beautiful landscape brimming with teal-coloured lagoons, blue glaciers, snowcapped mountains and lakes that mirror the sky. The Torres de Paine National Park has long been considered the 8th Natural Wonder of the World. The ideal location for a hiking holiday or a rural retreat, it is the perfect place to get-away-from-it-all and rekindle a love of Mother Nature. Our collection of the best places to stay in Torres del Paine range from luxury resorts to charming eco-lodges. Torres del Paine was named after the great granite spires that loom out of the Paine Massif, the name itself translates as the "Towers of Paine". The National Park covers 181,414 hectares of dark green forest, raging rivers, bright blue glaciers and mirrored lakes; the landscape teems with guanaco - a species related to the llama - and pumas, while the sky soars with Andean condors. Most days, you can see the baqueanos - Chilean cowboys - ride their beloved horses through the rugged terrain. Turned into a UNESCO Biosphere Reserve in 1978, there is an unspoilt purity to the region, even in spite of the sheer number of visitors that come each year. Hiking trails abound, like the W-Trek and the Paine Circuit, all of which provide breathtaking views. On the way, you will encounter a spellbinding variety of things to see, like the Grey Glacier, which ironically shines a pallid blue in the sunlight, or the Mirador Torres - a gorgeous blue lake that provides unbelievable views of the three towers. Torres del Paine is not for the faint-hearted. The weather, even in summer, is windy and changeable and the activities available are all based in the great outdoors. Take a guided or local ranger and try and spot pumas, which inhabit the land and prey on baby guanaco, kayak on a lake and row past ancient glaciers or go horseback riding with local baqueanos. Go hiking on either the Paine Circuit or W-Trek and marvel at the incredible landscape all around you. Head to the Mirador Torres, a beautiful blue lake, and stand in speechless awe at the three granite towers jutting into the sky. Go puma-tracking with a guide! Ride horses with the baqueanos, local Chilean cowboys. Visit the French Glacier on the Paine Grande mountain. Kayak amongst pale blue glaciers on a lake that mirrors the sky! 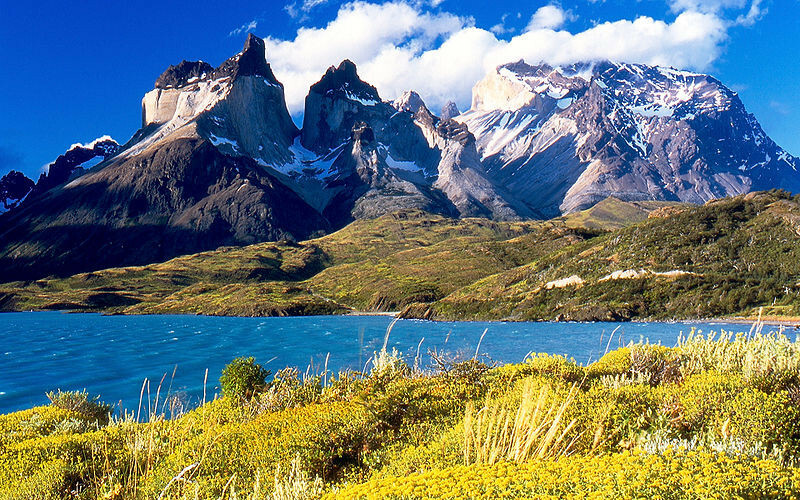 Torres del Paine is undoubtedly one of the most beautiful regions on the planet. 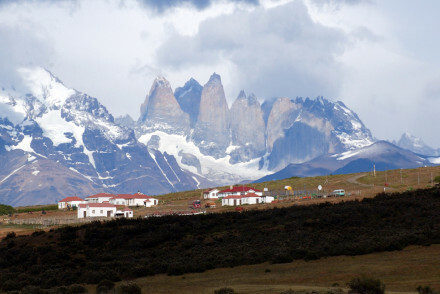 To start planning your trip browse through our collection of the best places to stay in Torres del Paine. EcoCamp: ideal for a hiking holiday, it offers charming little eco-domes for guests to stay in. Remote, secluded and boasting gorgeous views, this is getting-back-to-nature at its best. Estancia Cerro Guido: a remote and typical Patagonian ranch on the edge of the Torres del Paine National Park. The rooms are simple and rustic, the restaurant is fantastic and the location is simply divine. A hiker's paradise. 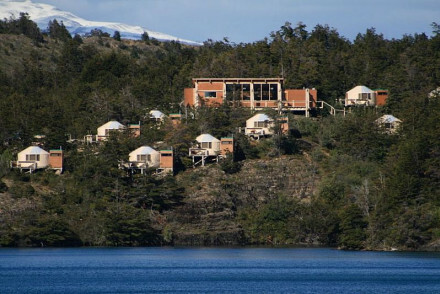 Patagonia Camp: a small collection of luxury yurts nestled into the hill overlooking a stunning lake. Simply designed with their structure beautifully exposed. 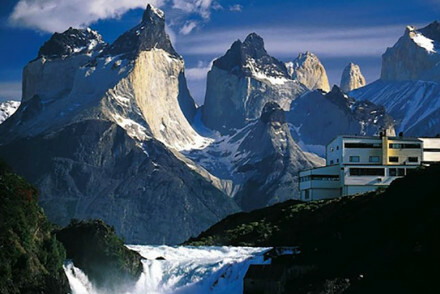 Explora Patagonia: perched on a mountainside by a roaring waterfall, this hotel has an unbeatable location. The rooms are lush and contemporary, the spa is spoiling and the views are spellbinding. Awasi Patagonia: a small cluster of wooden villas, set in an outstanding location overlooking the Torres del Paine National Park. Includes a fantastic restaurant too. 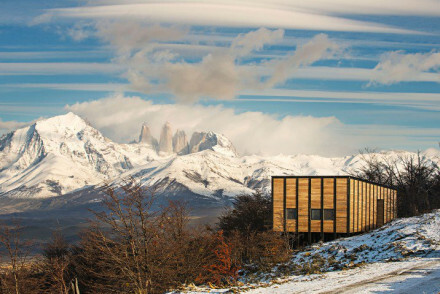 Tierra Patagonia: a stunning property at the edge of the National Park, offering minimalist rooms made of wood and glass. Designed by three of Chile's most renowned architects, it offers a pampering spa, an indoor pool and a gourmet restaurant. Enchanting. Check our partner Booking.com to see if they have any villas and apartments in the nearby area. The best time to go is between October and April, when the temperature is at its warmest, averaging at around 20 degrees. Be prepared: it gets very windy and the weather can be changeable! Make no mistake, it is a trek getting there. Fly to Santiago, then on to Punta Arenas, from where you can catch a bus to Puerto Natales and then, get a bus to Torres del Paine. Expand your search to include our collection in Santa Cruz. Browse through all our options for the best places to stay in Chile. 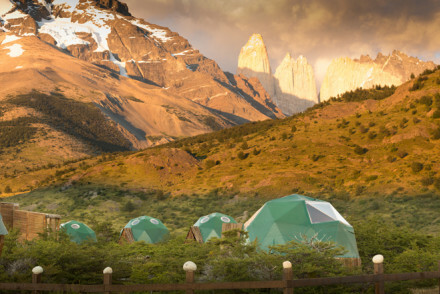 A beautifully crafted camp in the heart of the spectacular Torres del Paine National Park. Individual domes have cosy interiors and wonderful views of the surrounding mountains. Hearty regional fare is served up in the restaurant and picnics are provided for day trips. An outdoor adventurers haven. Active Holiday - Sleeping in the domes gives a feel of being in the great outdoors and the surrounding terrain is ideal for trekking. Kayaking - Kayak on stunning fjords. A charming ranch boasting an epic location on the edge of the Torres del Paine National Park. Simply dressed rooms feature polished wooden floors, crisp white linen and fireplaces. Find hearty regional fare in the restaurant. The utter remoteness makes this an outdoor adventurer's dream. Back to Nature - A remote Patagonian lodge right on the edge of the Torres del Paine National Park. A small collection of luxury yurts nestled into the hill overlooking a stunning lake. Simply designed with the their structure beautifully exposed. Views from the rooms are spectacular and the silence intoxicating. The perfect base to return to after a day spent in Torres del Paine. Fabulous. Back to Nature - Located on a stunning lake just outside Torres del Paine. Kayaking - Head out onto the lake on one of the hotel's kayaks. Fishing - Salmon and trout fishing trips can be arranged. A contemporary hotel with an unbeatable location in the heart of the Torres del Paine National Park. With views this good the hotel is naturally designed with plenty of glass for maximum vantage points. Get pampered at the modern spa after a day in the great outdoors. A unique experience. Back to Nature - A totally outstanding location in the heart of Torres del Paine National Park. Active Holiday - The area is perfectly primed for numerous outdoor pursuits. 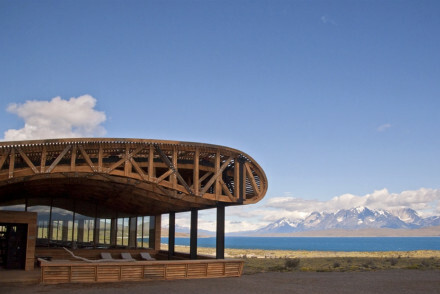 A stunning contemporary hotel designed by three of Chile's most renowned architects and situated on the edge of the Torres del Paine. Simply designed rooms feature plenty of wood and glass. A fabulous spa will ease away any aches and pains. A truly unique property ideal for exploring rural Chile. Back to Nature - Located in the beautiful Patagonian steppe on the edge of the Torres del Paine National Park. Magic. Spa breaks - The stunning Uma Spa offers an outdoor Jacuzzi, sauna, steam bath and an extensive therapy list. Active Holiday - The surrounding terrain is perfectly primed for outdoor pursuits. Birdwatching - Wonderful bird spotting opportunities including condors and caracaras. A small cluster of wooden villas, set in an outstanding location overlooking the Torres del Paine National Park. Simply designed, well-appointed villas take advantage of the views from large windows. Exquisite contemporary Patagonian dishes are served alongside a great selection wines. Superb. Back to Nature - With impressive views and easy access to the Torres del Paine National Park, the 'eighth wonder of the world'. Birdwatching - Take a trip to the Laguna Azul (Blue Lagoon) where numerous species can be spotted along with the odd llama too. Restrictions on children - Children above 5yrs old are welcome.